Contemporary ceiling design transforms the interior of the Travis Credit Union Vaca Commons Branch. The interior look of a California credit union was converted into an open concept to encourage cross-function collaboration and marketing opportunities. The new design seeks to enhance visibility and security for the banking institution. 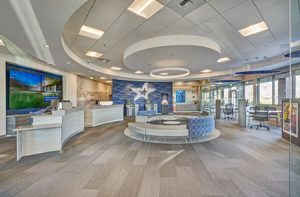 Serving as both architect and interior designer, arcINTERIORS worked closely with Travis Credit Union, and Sierra View General Contractor to complete the project. Built in 1992, Travis Credit Union at Vaca Commons, is a 557-m² (6000-sf), single-story structure with a wood-frame construction. This original branch was designed with a more conventional approach to branch banking. “One of the main goals for the recent transformation was to create a branch that was modern in aesthetics, but still provides a sense of comfort and intuitiveness for the members from the moment they first walk into their branch,” said arcINTERIORS principal Aileen L. Sulzinger, CID, LEED AP. Stone wool ceiling panels and suspension systems helped achieve a modern appearance, and transition from the suspended acoustical tile ceiling to gypsum board soffits. The suspended acoustical tiles are hung askew to create the illusion of an expansive space. The curved designs of the gypsum board soffits are used as wayfinding tools as they guide members from the entry and through the perimeter. The stone wool ceiling panels also contributed to the improvement of sound quality throughout the space with its 0.75 noise reduction coefficient (NRC) standard sound absorption – a 50 percent increase from the previous design. Further helping to create more comfortable areas throughout the space, the waiting areas’ ceiling design features a circular, low soffit with suspended lighting. The smooth surface and bright white color of the ceiling panels reflecting up to 85 percent of light. During the day, natural light from the exterior is reflected throughout the interior, lessens the need for electrical illumination. The stone wool ceiling panels have earned Underwriters Laboratories (UL) Environment’s Greenguard Gold Certification for low-emitting products. More than 417-m² (4484-sf) of the building was completely renovated. The remainder of the building was upgraded cosmetically. In addition to the ceilings, the entire building’s mechanical systems, major portions of its electrical systems, and the entire roof were replaced. The successful renovation of the Travis Credit Union Vaca Commons Branch and Wealth Management office will provide a prototype for their other locations.